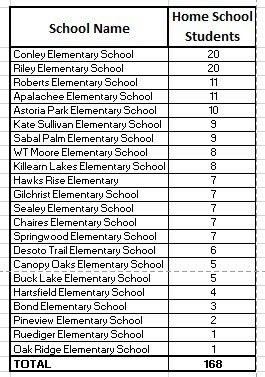 Based on data requested by Tallahassee Reports, Godby High School has the highest number of home school students in Leon County with 231. Godby is followed by Leon High School with 220 and Rickards High School with 196. These numbers are based on students that enrolled in the public school system and at a later date elected to home school. There are approximately 1,000 home school students in Leon County that never enrolled in a public school. This is the third report by TR investigating home school students in Leon County. Tallahassee Reports has previously published a report on the growth in home school students in Leon County. Subsequently, TR received information and published a report that showed 33% of home school students were not in annual compliance. 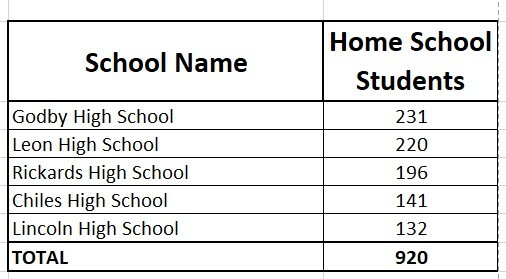 The charts below show the numbers of home school students for five Leon County’s high schools, middle schools, and elementary schools. 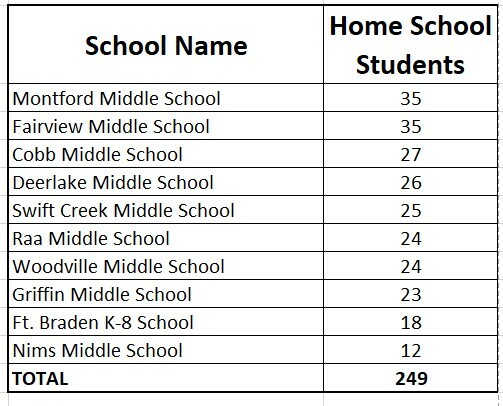 The enrollment numbers show that Montford and Fairview lead middle schools with 35 home school students. Conley and Riley lead elementary schools with 20 home school students. TR is seeking information from Leon County Schools about the process involved with becoming a home school student and has also requested compliance numbers for each school. 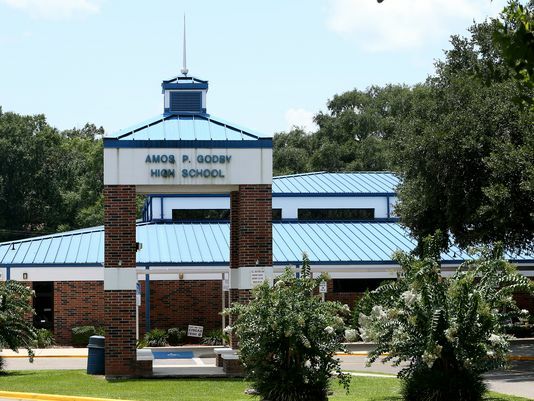 22 Responses to "Godby High School Leads Leon County in Home School Students"
SO, do the Parents & Students get a Lesson Plan to follow and the County administers the Tests on line to see who is actually being properly Schooled? There should be a report/investigation into how many children do NOT go to the school they are zoned for. So over 1300 children in Leon are homeschooled. This number seems low based on how many families participate in the local homeschooling groups. I wonder how many are missed because they use FLVS, which I assume isn’t counted here since LCS gets FTE money for those students. County virtual students are different from homeschool students. My teens have used FLVS and they are registered homeschoolers. We can pick and choose which classes we want to do, not a full curriculum like county students that are registered as public school students. Is this article suggesting that there are 130 up to 230 student at each high school that once attended elementary and middle school and all of a sudden the parents decide to homeschool them in high school? code because it was the only way that they could get their child into Lively Technical? I wonder why there is no comments from Leon County School Board on this issue? Did they not know about this information? Did they know about this information and don’t care to comment because they are afraid that they will be next on the Rocky Hana “hit list”? Please send this information to the Commissioner of Education and the Governor, I think they will care about the issue. So, are you saying that if a Student is Expelled for the Year, Hana could use a “Home School Code” so it doesn’t hurt the School / County Funding? Someone needs to do a public records request for Kathleen Rodgers’ withdrawal / truancy / discipline records.In my personal experience she has not been forthcoming, but there may be a way to answer that question in whatever she decides to hand over. Leon County Schools come clean before the investigation deepens! ?? ?- above chart totals don’t equal the 2346 number of home schoolers in other related article. ???? Can’t speak to the implications of the Godby numbers other than to point out that newspaper reports said the kid shot and killed in broad daylight on Old Bainbridge last month was a former Godby student who had left for homeschool in January. Rocky and team’s policy has wide ranging implications. I hope at least one of them pauses to think about that kid, his family, the people/public who witnessed the murder and whether their homeschool approach contributed. Mimi – if by “homeschool approach” you mean they didn’t do ANYTHING, including supervising what he was doing and keeping track of him as responsible parents should, yes. I think the implication of the information is that parents are being forced to homeschool when they have no means of doing so. More details would be needed for this particular case which seems to be related to sidestepping drop out numbers. I can tell you that in my case as a parent rocky’s team has tried to compel me to homeschool my child multiple times knowing I had no means of home educating or supervising him because of work. It could of resulted in a safety issue because he was so young at the time. My child’s safety was completely not on their radar. Please call the Commissioner of Education to share this information. Requesting or talking a parent into home schooling is an ethical violation. Mark if I had a dollar for every ethical violation my family has personally experienced with this school district I would be retired in the Caribbean. Problem is, no one cares and there is no accountability. That’s why it keeps happening. My heart goes out to the family. If anyone in the Leon County School system approached this family to withdraw the student to home school, the school system should be held partially responsible for the tradgedy. This issue definitely needs some clarification and accountability. Thank you TR and Mark! So today TDO boasts a rstory of a ribbon cutting ceremony at Fairview with Rocky Hanna and School Board Members (while the Principal of Fairview was named in an affidavit as knowing Rocky fathered a child that he deliberately did not pay child support for 10 years until sued, while said Principal and lifelong buddy did not report Rocky for investigation) a family lost a child to a violent death when the student should have been at school, but suddenly in high school at Godby, the student withdraws to homeschool? Why is the community not in an uproar demanding accountability? A picture of Hanna cutting a ribbon, but a small story of a student withdrawn to homeschool that Chris Petley the Leon School Spokesperson is quick to say was homeschooled not a Godby student. 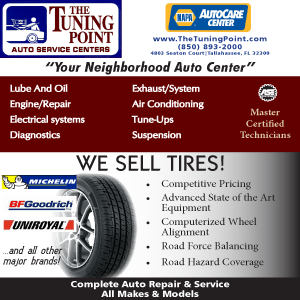 Wake up Tallahassee! The link between the student involved in the shooting and being forced to be homeschooled should be front page news on the Tallahassee Democrat from day one if this is true? Is fudging the dropout rate numbers a reality that needs to be checked and is it morphing into a public safety problem? I can tell you why. Withdrawing low-achieving students to home school doesn’t count against the school’s graduation rate. For instance, students have been enrolled in home school and then withdrawn from home school all in the same day. There’s a good possibility that the shooter, whether enrolled at Godby or homeschool, was going to commit a violent act no matter what. If the kid was enrolled at Godby, he would have been truant that day. Where he was enrolled has nothing to do with his character as a criminal. That being said, the home school ruse isn’t the only thing Godby has up its sleeve. What about the AP class for kids that can barely read??? It’s a work around so they don’t have to FAIL the end of course exams that the “regular”students must pass to graduate. Kids that should have extra help and have special needs are being enrolled in AP classes??? Happening at Gadsden County High, too. I wonder, though…is this commenting crowd the same crowd that advocates for vouchers??? The same result will happen with vouchers for this demographic of students. Their parents will take the voucher and no schooling will happen or they enroll them in some scam school and we get the same result. I am against vouchers, I think. I am starting to come around for FLVS after seeing a 5th grade language arts platform that is 10x better than what’s being offered in the classroom. I hope TR gets some answers…I was just thinking of doing my boys’ middle school “at home”.